Three solar power-generating floating laboratories are currently being built in Lake Neuchâtel, Switzerland. Constructed by Swiss energy company Viteos SA and developer Nolaris, the concentrated solar power plants will be able to rotate 220 degrees, assuming optimal position for capturing sunlight at all times. The floating laboratory islands are based on the model of concentrated solar power (CSP) plants that use steam produced through use of hot sunlight to propel turbines. Located 150 meters from the shore, each island is 25 meters in diameter and will be equipped with 100 PV panels. The entire structure rotates 220 degrees, assuming the optimal position for capturing sunlight throughout the day. The islands are anchored to the concrete blocks at the bottom of the lake by cables and will be plugged into the electricity grid at the shore by Viteos inverters. The labs are scheduled to be completed by August 2013. They will work for 25 years and after decommissioning, all the parts will be recycled. Obama's energy policy is right. The world goes solar. Japan's FiT in July is among the highest in the world. Japan's FiT is shaking the solar market. Now, EU has the same options. New solutions will be showed in Japan. This is it! As you know, earthquake in Japan is happening frequently. Floating solar panels installation is one of the best solutions for power crisis in Japan. Every year Some typhoons arrive Japan. The typhoon has strong wind. 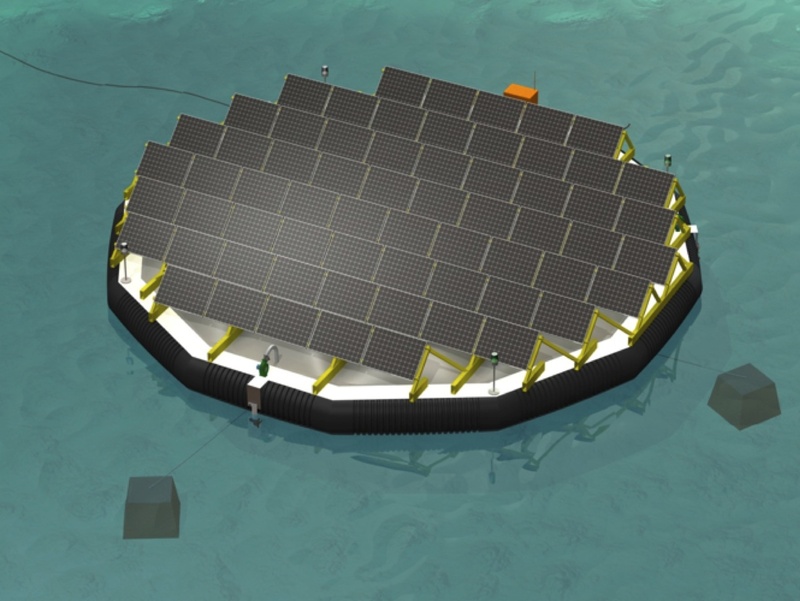 Floating solar power generation system must have constructed to resist typhoons. So you have to reduce vibration to install floating solar power generation system. Because, it can make micro-cracks to floating solar panels and the durability problem of floating solar power generation system. The risk of power loss in PV modules due to micro cracks is increasing. Vibrations caused by wind, waves and external forces. New Floating Body Stabilizer for Floating solar panels installation has been created in South Korea. The Floating Body Stabilizers generate drag force immediately when Floating solar panels are being rolled, pitched and yawed on the water. Recently, these Floating Body Stabilizers have been used to reduce vibration of Floating Solar Panels in South Korea. You can watch New Floating Body Stabilizer videos on YouTube. http://youtu.be/O2oys_YHhCc, http://www.youtube.com/watch?v=nA_xFp5ktbU&feature=youtu.be.